When we got our dog she was already 18 months, at first I talked to her in English, but she never did anything I said (or didn’t do as the peeing on the floor case may be). After awhile I figured that, as the previous owners were Chinese, I should switch to Chinese. Didn’t help the dog’s behavior, but for some reason I never thought to switch back. Maybe the previous owners spoke a local dialect around the house…. damn! I’m not sure as whether or not there have been studies on human-animal interaction in a second language, but police K9’s in the United States are commonly trained with commands in a language other than English. This prevents anyone other than the handler from being able to give commands to the dog and it reduces confusion for the dog in situations where commands are being given to the dog in large crowds. FYI, an infant works pretty well in this role, too. Good to know. In case I’m ever mauled by a police dog, all I have to do is scream setzen. I’m not sure why I talked to him in Chinese … maybe I was subconsciously following your lead, but it just felt natural. Hm, sounds like ordinary family life to me. No wonder he can’t understand. That’s obviously a Scottish dog. 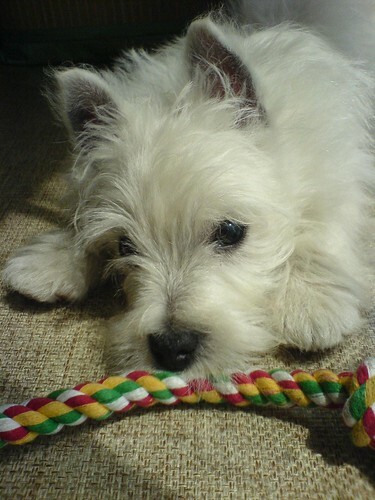 I had a Westy growing up, and miss him terribly. Wow, you’re still around! Good to see ya! Next step on the ladder: parrots? Funny, I always talk to pets and small children in my native language, never in English or Chinese. It feels more natural for me, and they don’t care much about the meaning anyway (in the case of small children, it also works to prevent them answering something that I don’t understand). People’s reactions are also interesting, some are quite anxious to know what I just said. Hi, I just found your site through a search related to the HSK. I am in the U.S., both my cats were born and raised in the U.S., but I talk to them in Chinese all the time! It helps me feel like I’m remembering the things I’ve studied when I try it out on them. I intentionally talk to infants and animals in Chinese (now that I’m here in the USA — though in China I spoke in Chinese, too). It IS a wonderful way to be “listened to” and to train your mind to use Chinese. And so much is about the tone of voice with little kids and animals anyway!